We were getting worried as we flew into Bozeman, Montana the day before our Winter Wonders Tour of Yellowstone National Park with Off The Beaten Path. 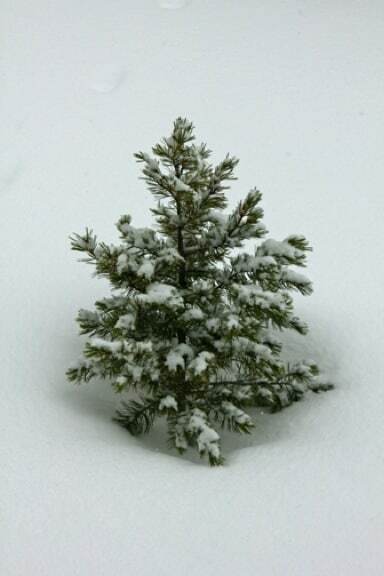 My daughter Alex and I had come with visions of snow-covered landscapes, but when we arrived the ground was bare and our shuttle driver complained about unseasonably warm temps. 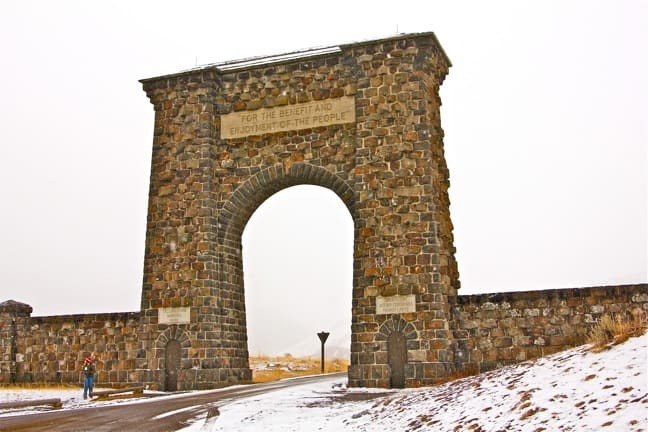 Fortunately, the morning we set off for the park it began to snow like the dickens, and we didn’t even reach Yellowstone before spotting our first wildlife, an expansive Elk herd traversing private farmland in the foothills of the Rocky Mountains. 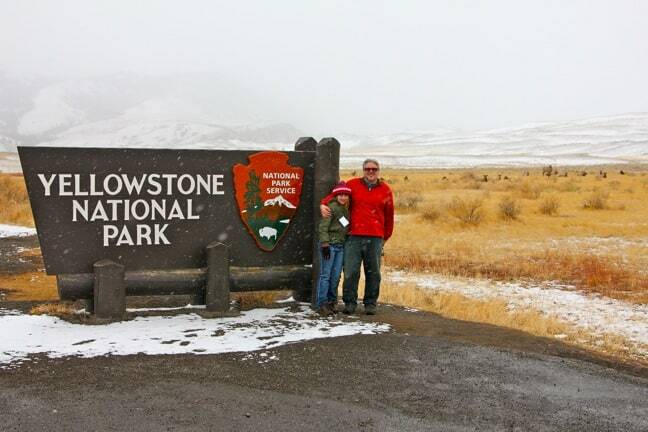 Despite the falling snow and bitingly cold winds, we couldn’t resist the typical tourist photo op at the Yellowstone National Park sign, especially when we realized there was another herd of Elk about 50 yards in the background. 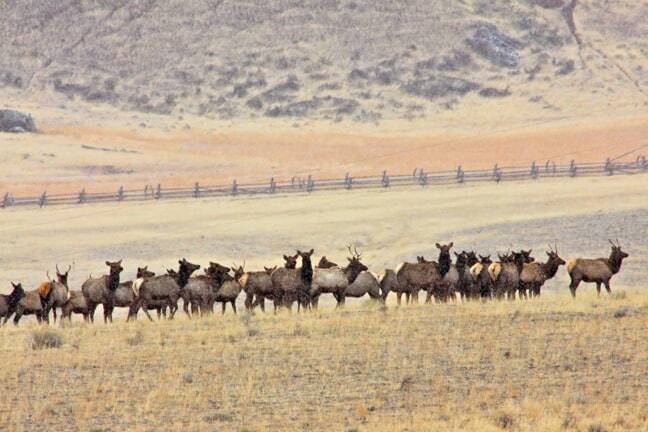 Elk, who normally stay in the higher ranges during warm summer months, prefer lower elevations in the winter, as it is much easier to get to the grasses upon which they graze when they’re not having to dig through several feet of snow. Our first stop in the park was the historic Mammoth Hot Springs Hotel, one of the oldest hotels in the park, which provided a perfect launching point from which to explore the otherworldly terraces of Mammoth Hot Springs and the abundant wildlife of the Lamar Valley. By the time we got there to dump our bags in our rooms, any worries about a lack of snow had been replaced with concern about whether we’d brought enough warm clothes for what, to our Atlanta-born eyes, seemed like a blizzard in the making. 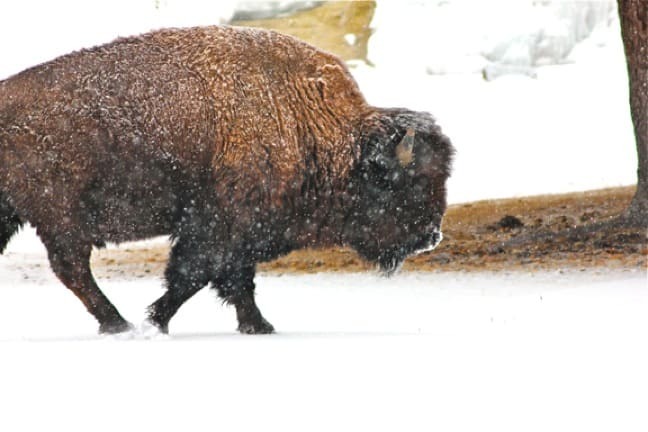 The good thing about copious amounts of snow is that it turns Yellowstone National Park into a glistening Winter Wonderland. 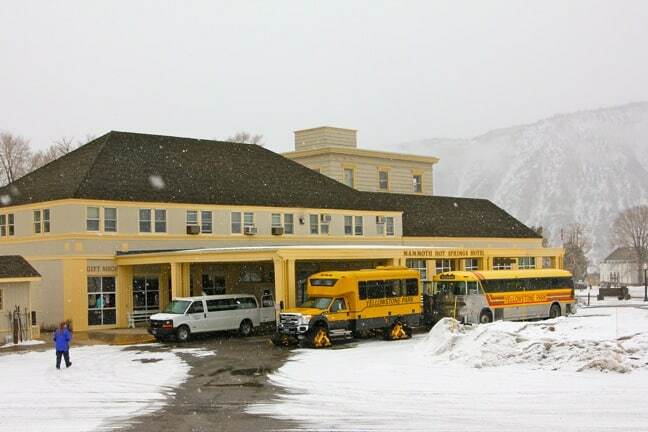 The bad thing is that the rapid fluctuations in temperatures made for very slippery surfaces, so our Off The Beaten Path guides sent us scurrying to the Mammoth Hot Springs Hotel Ski Shop to buy YakTrax. These ingenious (and surprisingly inexpensive) marvels slip over the soles of your shoes, with tiny metal springs that provide incredible traction on icy surfaces. 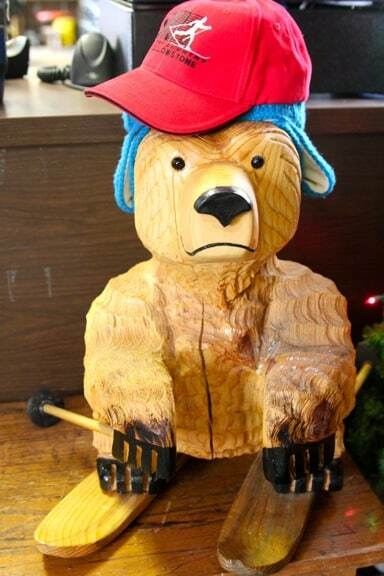 While we were trying them on I spotted this sporty ski bear, who made Alex and I giggle. 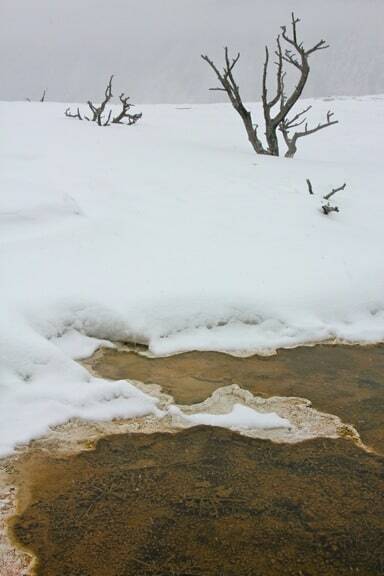 Neither Alex or I had ever seen the sheer volume of snow on the ground that we found as we explored Mammoth Hot Springs. 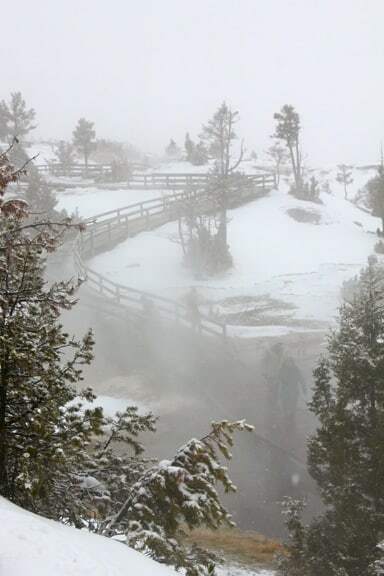 Although the boardwalk had just a few inches that had been tamped down by previous visitors, the trail was lined with snow-capped Lodge Pole Pine Trees that made the area look like a picture-perfect Christmas card. Little did we know that landscape was about to change in extremely otherworldly fashion. When we got to the overlook of the Main Terrace of the hot springs, this was the first sight that greeted our eyes. The relentless flurry of snowflakes, the steam from the hot springs meeting the cold air, and the acrid odor of sulphur from the area’s constant geothermal activity made for an overwhelming first impression, providing a strikingly alien contrast to the peaceful serenity of the upper trail. Our guides for the Off The Beaten Path trip were Kurt Westenbarger and his lovely wife, Eve (a soil scientist by trade). 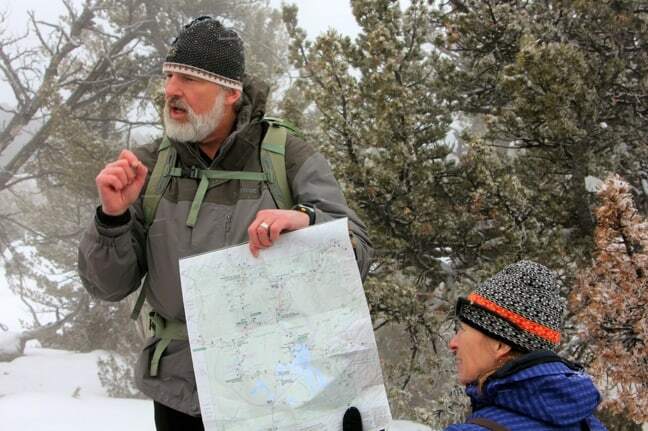 Kurt, who grew up nearby and has been guiding in Yellowstone for over 20 years (he even leads tours for National Geographic), has an encyclopedic knowledge of the area’s geology, history and wildlife. Here, he explains how the large complex of hot springs on travertine hills were created over thousands of years as hot water cooled and deposited calcium carbonate. Over two tons of the stuff flow into Mammoth every day, so the landscape literally changes from week to week. As a result, the area is full of unusual geological formations that are constantly evolving. These bizarre shapes in the water reminded me of miniature stalagmites, and when zoomed in on with my 400 mm lens looked like a vast crystal forest. But everywhere you looked in the hot springs, there were dozens of odd sights vying for your attention. 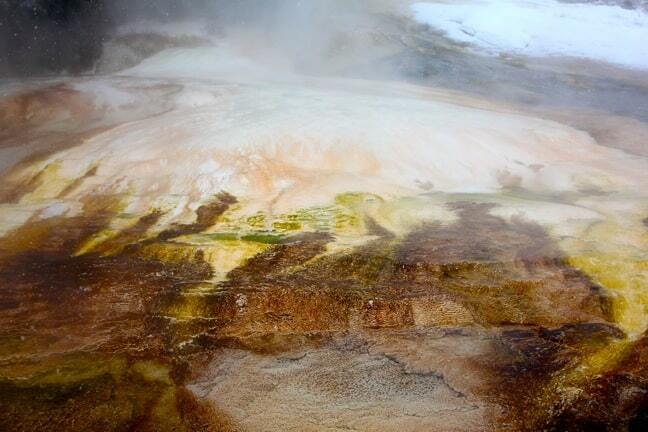 This section, known as Dryad Spring, found the color of the rock changing as the water cascaded down the terrace. 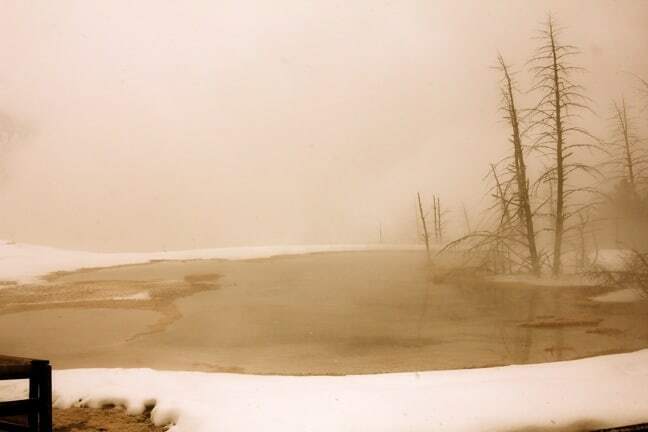 It went from white to cream, to beige, to ochre, to bright green and brown, due to the various forms of algae that thrive in the warm (around 170 degrees Fahrenheit) pools. 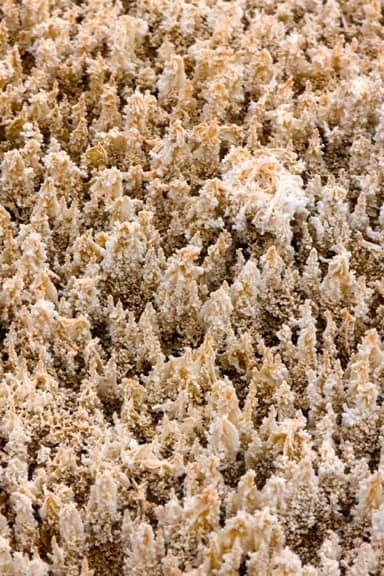 But it wasn’t just the colors that made the springs so oddly fascinating: everything that fell into the water became coated in the limestone-fed calcium carbonate, taking on an alien look all its own. As Kurt explained, the level of calcium carbonate (which is used in everything from toothpaste to antacids) in the water is so intense in some areas that it gets into the roots of the trees and kills them. But the process also effectively preserves the trees for eternity by preventing decay, which leads to stark landscapes that reminded me of the Namibian desert (you know, if the Namibian desert got a TON of snow). One of my favorite photos from our first day in Yellowstone. Canary Spring lies on the edge of Mammoth’s main terrace, and seemed to be even more shrouded in fog than the myriad other springs and terraces we visited. Mammoth loses some appeal when its unique features (such as the colorful dry terraces) are completely covered in snow, but Canary seemed to gain even more character, reminding me of something out of a Stephen King novel.